The New Zealand dollar continues to decline against the US one. The pair remains within a wide lateral channel, but has moved to a downward trend, having tested a local minimum of 0.6720, which is the lower border of the range. The decrease in the instrument is due to favorable releases from the USA on inflation, major indices, and labor market. A soft monetary policy of RBNZ puts pressure on the New Zealand currency. Additional support for the USD is provided by comments on the possible next interest rate hike by the Fed. However, the US dollar is oversold, indicating a high likelihood of increased investor demand for it in the future. Today one should pay attention to the speech of representatives of the FOMC, which may give a signal about the likelihood of a rate hike. From Tuesday, other major US releases will begin to appear: data on industrial production, retail sales, and the construction sector. In the medium term, the pair is expected to decline; a local minimum may be taken and the trend will change from the lateral to the downward one. If the local minimum and the lower boundary of the channel is taken, the impulse may increase due to the growth of the volume of short positions. It is unlikely that the New Zealand currency will be able to break through the key resistance levels of 0.6950, 0.6970, however, in the event of the publication of negative statistics from the USA, the lateral trend may preserve. Technical indicators on the D1 chart keep a downward signal: MACD indicates an increase in the volume of short positions, and Bollinger Bands are pointing downwards. Support levels: 0.6720, 0.6700, 0.6650, 0.6600, 0.6545, 0.6500. Resistance levels: 0.6770, 0.6825, 0.6850, 0.6905, 0.6950, 0.6970, 0.7000. 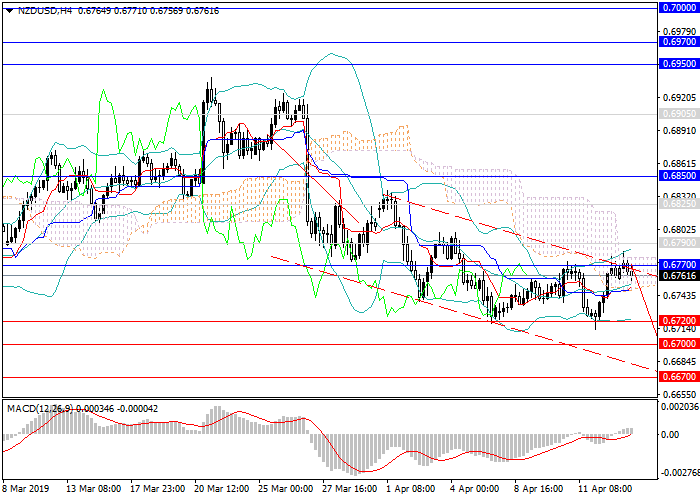 Short positions may be opened from the current level with targets at 0.6720, 0.6700, 0.6600 and stop loss at 0.6790.